At the westerly end of Chesil Beach, nestling in the beautiful Bride Valley where the river Bride wends its way to the sea, lies Burton Bradstock, a pretty village of some 1,000 residents. Today, the heart of the village is still unspoilt with pretty 16th. and 17th. century thatched cottages clustered around the church St. Mary the Virgin. The main part of the church is 15th. century although the north wall of the nave, with its two original windows, dates back a further 100 years or so. 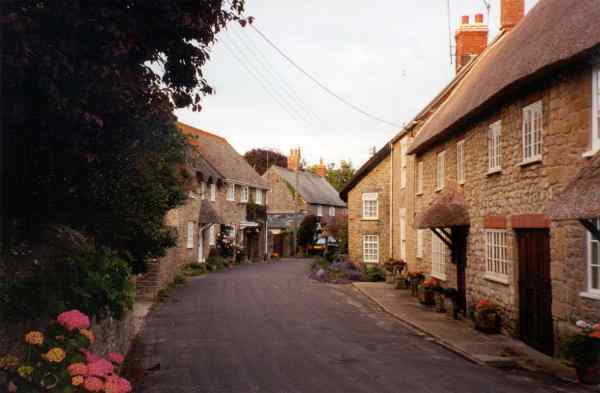 As with most villages, Burton Bradstock has had its share of developments of modern houses, but its central character remains intact. The village has a school, a shop, post office stores, cafe on the beach, two pubs, hotel, garage, Village Hall, Reading Room and even a library! Few modern villages can boast so many amenities. It has an impressive range of active groups including the Church, Women's Institute, Royal British Legion, Village Society, Burton Bradstock Players, and Parish Council to name but a few. A major section of this web site is the Archive which includes over 1,000 old photographs, maps, documents and articles plus video clips and recordings. The village has created a historic walk entitled “Roberts' Trail”, designed around the contribution Richard Roberts, an entrepreneur of the day, made to the village in the eighteenth century. Roberts built two water mills in the village to swingle (clean and ret) and spin/weave flax for a wide variety of products that were exported all over the world. His mills were the first of their kind in the west country, hence his initiative and foresight firmly established Burton Bradstock as the centre for the flax swingling/processing industry. A booklet with a map describing the trail is available (for a small charge) at the village post office.